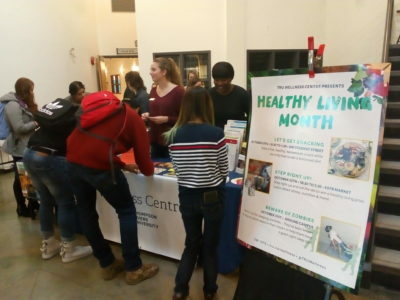 Earlier this month, under the coordination of the TRU Wellness Centre, the university celebrated healthy living to promote the importance of nutrition and maintaining a well-balanced diet. Two of the events scheduled included interactive activities where students sampled healthy homemade snacks and learned about ways to cope with stress through self-care. “We looked at the trajectory of a student. Usually October is a time when there are a lot of midterms, students are stressed and sometimes it’s hard for them to take care of themselves. We thought if we looked at October as healthy living month, we could think of some key pieces that would help support student’s health,” said Chelsea Corsi, a TRU Wellness coordinator. Besides the importance of nutrition, Corsi said the Wellness Centre also wanted to educate students on the importance of sleep and exercise as well as teach them strategies that could be employed to reduce stress. The first event, called Let’s Get Snacking, was held on Oct. 24 in the Old Main Building on Student Street. Students were offered free fruit, quinoa salad, soup, recipes and informational pamphlets on nutrition. “It’s hard to keep on track especially if you’re not meal prepping, so this is just to give students some ideas,” said Angela Kadar, a student wellness ambassador. “This is actually a collaboration with ESTR Market, so everything was made from scratch. Basically, we’re just providing information like the Canadian Food Guide and also information on how to connect to the Food Bank,” she added. Kadar said the Wellness Centre office, located in OM 1479, also has additional information on wellness for students regarding food, sleep and study tips. The second event was called Step Right Up and was held on Oct. 25 in ESTR Market. Students were once again invited to free samples and were also given the opportunity to play mini games for healthy living prizes. “We have some fun facts about some of the food options on campus, so the purpose of the game is to promote awareness for being healthy and how to be healthy on campus for students and faculty,” said Naomi Woolverton, another student wellness ambassador. Speaking for all of the month’s activities in general, Corsi admitted that even though healthy eating is one of the core foundational components to well-being, people tend to make poor food choices when they are stressed. “We all go through those peaks and valleys of stress, especially right now with students with midterms and papers being due. It’s just to think about those things like maybe healthy eating isn’t as hard as you think it is– we can make it quick,” said Corsi. Healthy Living Month will conclude with the final event, Beware of Zombies, which is scheduled to take place around campus today. Corsi said students should expect to be on the lookout for “sleep zombies” attacking to help support student well-being through promoting the importance of rest.